The Remote Machining solution designed specifically for the Makino line of Pro 5 Mills is a software solution that provides many of the same powerful features and capabilities of our hardware solution while adding the ability to be installed remotely. No service visit, no waiting; just an internet connection and a phone call is all it takes to get you up and running with Remote Machining on your Makino Pro 5 Mill. Just like our hardware adaptive solution, no software is needed on the computer being used to access and control the mill. 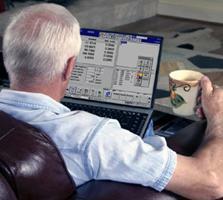 Control your Makino Pro 5 Mill from anywhere with just a computer and an internet connection. And again, just like our hardware solution you do not have access to certain function for safety issues as determined by OSHA standards and safety specifications. Remote Machining for your Makino Pro 5 Mill can be purchased outright or installed and enabled on a subscription basis. Contact Remote Machining for pricing and availability for your shop. Remote Alarm Notification, allows real-time, remote monitoring of the alarms and warnings on a Makino Pro 5 milling machine via emails, text messages or an integrated web-site. Like Remote Machining, installation can be performed remotely, without the need for an installation technician visit or significant downtime. 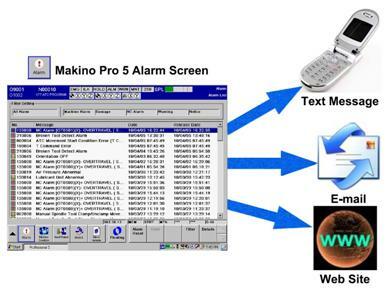 Remote Alarm Notification sends the information found on the Makino Pro 5 alarm screen in emails and text messages as the alarms and warnings occur. Coupled with Remote Machining through the Remote Machining Service Portal, the alarm and warning status of the Mill can also be viewed on an integrated web-page. Unlike traditional auto-dialers and pagers, Remote Alarm Notification uses your network so it requires no additional phone lines and can send multiple simultaneous notifications to different destinations. Contact Remote Machining for pricing and availability for your shop.